The fun-loving, playful Miniature Bull Terrier was once a fierce fighting dog but those days are long behind him. Today this breed is often described as “clownish” because of their cheerful temperament. The Miniature Bull Terrier makes a good family dog as long as they don’t become too exuberant when playing with children. These dogs do need firm handling because they have a strong, protective personality. Good dog training and socialization are recommended, as well as plenty of exercise to keep them mentally and physically happy. 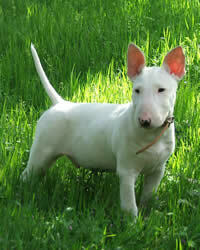 The Miniature Bull Terrier has the same origins as the Bull Terrier. These dogs were bred to bait bulls in England prior to 1835 when that sport became illegal. Bull Terriers the size of the Mini Bull Terrier were common in the early 19th century as a result of crossing the Bulldog with the (now-extinct) White English Terrier. Later breeders felt that these dogs were not big enough so they crossed the dogs with the Spanish Pointer for size. The result was Bull Terriers in a wide range of sizes. Breeders separated the dogs into Miniature size and Standard, leading to the current Bull Terrier and its miniature version as we known them today. Breeders later worked to make both sizes of this dog breed good companion dogs instead of fighting dogs. Today the Miniature Bull Terrier is still a fearless dog. They are highly courageous, as you would expect of a dog from their heritage. However, these are not aggressive or dangerous dogs. Instead, they are affectionate, gentle dogs in the home. These little dogs have a good nature and are usually very playful dogs. They are active dogs and they can be very determined. They are not a dog for a wimpy person. It takes a person with a strong personality to live with a Mini Bull Terrier because these dogs also have strong personalities. This dog breed doesn’t do anything halfway. They are loving dogs but they can be stubborn at times. They are very energetic and, for this reason, you need to be careful if you have children. These dogs love children but, because of their energy and rough housing, they can accidently knock a child down or hurt them while playing. The same is true with elderly people. This dog breed may not get along with other pets. Living Environment – These dogs can adapt to living in an apartment but they do require a great deal of daily exercise. They need both mental and physical stimulation to avoid developing behavior problems. Grooming – Grooming for this breed is simple. They have a short, sleek coat which needs to be brushed a couple of times per week. Bathe occasionally. However, this breed does require some sunscreen on exposed skin where hair is sparse since they can be prone to melanoma. Diet & Exercise – The Miniature Bull Terrier is prone to obesity so you should be careful not to overfeed. They are typically very active so make sure they get enough exercise. Otherwise they can become destructive in the home. Health – The Mini Bull Terrier can be prone to deafness and puppies should be BAER-tested before going to their new homes. The breed can also be prone to luxating patellas (slipped kneecaps), polycystic kidney disease (PKD), Bull Terrier heredity nephritis (BTHN) and primary lens luxation. Aortic valve stenosis and mitral valve dysplasia are also possible problems. The breed can also have some skin problems such as hot spots, allergic reactions and hives. If you are interested in this dog breed you should talk to a breeder about possible dog health problems. Miniature Bull Terriers are intelligent dogs but they can be stubborn at times. These dogs require plenty of dog training from a young age so the owner will always be in charge. Mini Bull Terriers also need lots of good socialization from the time they are puppies so they will be accepting of friendly people and other pets. Training and socialization are keys to making sure your dog is a good companion. Positive dog training methods (praise, rewards) are recommended as a training approach for this breed.